Answer to Prayer is an airy ocean front home that is just the ticket for enjoying Topsail Island up close and in style. The house accommodates up to 8 guests with 4 bedrooms and 2 baths. Answer to Prayer is located in North Topsail Beach over the North High Rise Bridge to the island and 3 1/2 miles south. It is a short drive (4 miles) to downtown Surf City for shopping and dining. A pet friendly, smoke free refuge for you, your family and friends is waiting. You'll love the mornings. We like to get up early with a steaming cup of coffee and sit out on the deck. It's so quiet, but the beach is waking up. The waves crash on the shore, sea gulls gawk at one another. A flock of pelicans come 'floating' on the winds as they cruise the tops of the waves looking for breakfast. The morning sun warms us up. My husband decides he wants to go for a ride on his bike. He heads south on the bike shoulder lane waving at the friendly islanders driving in the early morning. After a good run to the southern part of the island, he gets off at the point to smell the jasmine and salt air. As he heads back, he stops at "Seas the Day," a beach house owned by a friend of ours in Surf City. We have friends staying there who have come to Topsail Island the same week as us. After he greets them and visits for a while, he invites them to the barbecue we are planning that night. While he is riding on his bike, I decide I will take a quick dip and swim a little. The water is chilly at first, but then the Caribbean kissed waters seem to warm up. After a workout, I climb back on the beach and then to take a shower. I decide that I will lay in the sun later. But first I want to do a little shopping at this absolutely darling clothes shop in Surf City. I could go on and on about how much you'll enjoy Answer to Prayer, but I invite you to come and make your own vacation. Roger and Darlene are from Gahanna, Ohio, a suburb of Columbus. Roger is originally from the San Francisco Bay Area and Darlene is originally from Indiana. Growing up without a North Carolina beach. We love Topsail Island. With the stress of life it is great to get away with friends and family. We have two grown children who also enjoy joining us at the beach. After sending our daughter off to school at UNC Wilmington in the fall of 2005, we decided to look for a vacation rental in the area. Really just out of curiosity. Being from Ohio this beach is a real treat and being an architect I wanted a house that was architecturally exciting. One of our dear friends had purchased a house and a duplex and told us about Topsail Island,and how quiet and not crowded it was. Well I feel in love with 'Answer to Prayer' in September when I came up for a parents weekend. We waited until March to make an offer and it was still on the market ( in 2005 things were moving a lot faster). We really felt our prayer had been answered when price was reduced, we both were in agreement and the house was available. We have had fun painting and decorating and relaxing with our friends on the deck. Many of our families who stay come back year after year, treat the house as it was their own and call it home. We hope you will enjoy our home too. i hope you will too. The house is kid friendly with gates for the stairs going down to the beach and to the driveway. Also suitable for keeping dogs on the deck. We provide a high chair and games and DVDs. Each bedroom has a ceiling fan as well as A/C for upstairs and down. Turtle watching is also quite common in this section of North Topsail Beach. Two full bathrooms with tub in one and jacuzzi in the other. Bluray player. You can access Netflix through the player. Spent a wonderful spring break with my entire family.. even on the rain days we enjoyed the view and the comfortable space! Thoroughly enjoyed our stay at Answer to Prayer. The large deck was perfect for reading, napping and enjoying dinner to the sounds of the ocean. We felt spoiled by the private beach access. Our family of four had plenty of space and the high ceilings made everything feel open and bright. The wall of windows offered a perfect view of the ocean even when inside. The kitchen had all the amenities we needed for cooking in a few nights. We would definitely stay at Answer to Prayer again. 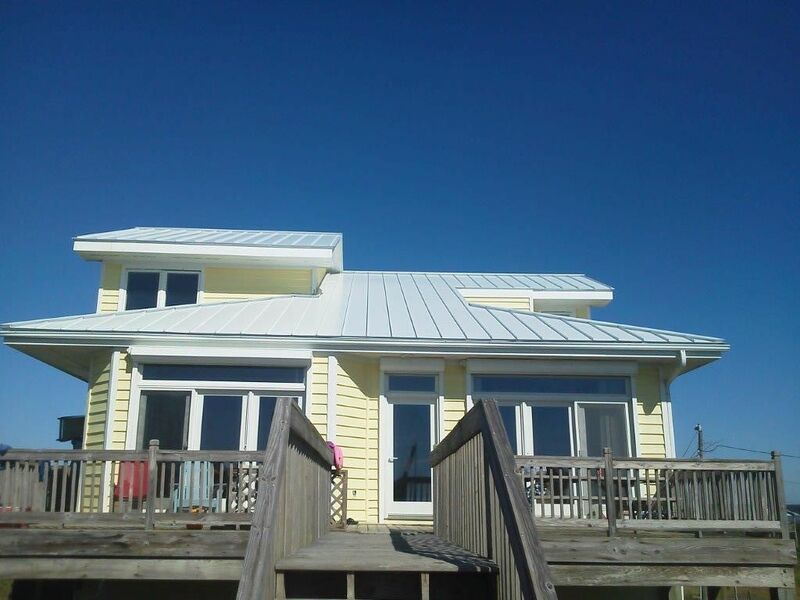 Clean, affordable, hospitable, right on the beach, great deck, great beach equip, kitchen wear, etc. This isn’t a fully remodeled house. Has some age but it was great for the price and clean and safe and they accepted our dog. The only downside is there is a public beach access right next the house so people would plop down right behind the house and that can kinda ruin a romantic sunrise date where you just want it to be you and your girl or confuse the kids later in the day as they were running around and would not feel the 100% freedom we wanted them to feel. The beach is the last place I want to set restrictions on the kids. Or when they would be looking for shells and grown a$$ men and women would come look right where they were. Weirdos. Overall I didn’t like the public access or Topsail compared to other beach destinations. The house was acceptable though. I do not like the public access either. At least the is only parking for 10 or so cars. as well as more parking for you. glad you liked the house. Beautiful location right on the beach. I would definitely come back. House was comfortable and very clean when we arrived. Owner was easy to contact and helpful. My only regret was not staying longer. I highly recommend this home if you want an oceanfront property. I would love to have you back again. We had a great long weekend. This is a great property. The open layout is great for sitting and spending time together and enjoying the ocean. Answer to Prayer is a lovely place right on the beach and we totally enjoyed our stay there! The home was a great place to escape the frigid northern temperatures. Every room provided all the necessities for an enjoyable month and a half stay. Thank you Darlene ! We hope to return. I am glad you had a nice visit come back anytime. Only 45 min from historic Wilmington NC. Tour the WW2 Battleship North Carolina. Flexible scheduling is available. Please contact us.